I’m glad I finally did. The place has won several awards from local press (mostly the Hippo), and some of these awards were definitely earned. The dumplings (momos) were definitely top notch, well-steamed little juicy pockets of flavors. The homemade pickles were spicy and excellent. The gundruk soup was powerfully spicy, but still flavorful. I was a little less impressed with my entree , which was Chicken Tarkari, chicken breast drenched in almond and cashew flour veggies and topped with a tomato sauce. The vegetables were good, the spicing right, and the portion size was good. It was definitely good, but a notch below the excellent appetizers. Overall, the flavors were excellent, the service nice, and the atmosphere cozy. Only downside was the price…. with a full dinner with apps and beverages, we were in for $70 for 2 of us, which seemed a bit high. That said, it’s some nice flavors that we can’t get anywhere else. I’ll be back. Greetings! I'm a FOY living on the east coast and read about your blog in the latest post. I followed the link and found your post here. What the heck kind of restaurant is Cafe Momo? I immediately thought it was Asian with the lovely dumplings. I adore dumplings but I'm the only one who seems to make them around here. Then, describing the main course, I thought Indian, maybe Spanish? Sounds very tasty with the nuts and tomatoes but the price is off the charts for us with little guys. 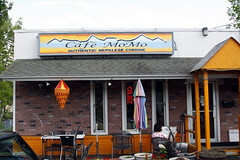 You know, reading over my original review I realized I glossed over the fact that Cafe Momo is Nepalese. I'll go back and edit it.